Super quick breaded chicken cutlets fried in a lemon butter sauce. These crispy cutlets are made without any egg or flour making them so quick and easy to whip up and leaves less washing up, hooray! Because we all love recipes made easier….. Breaded chicken cutlets are so easy to make and are sure to please the whole family at dinner time. 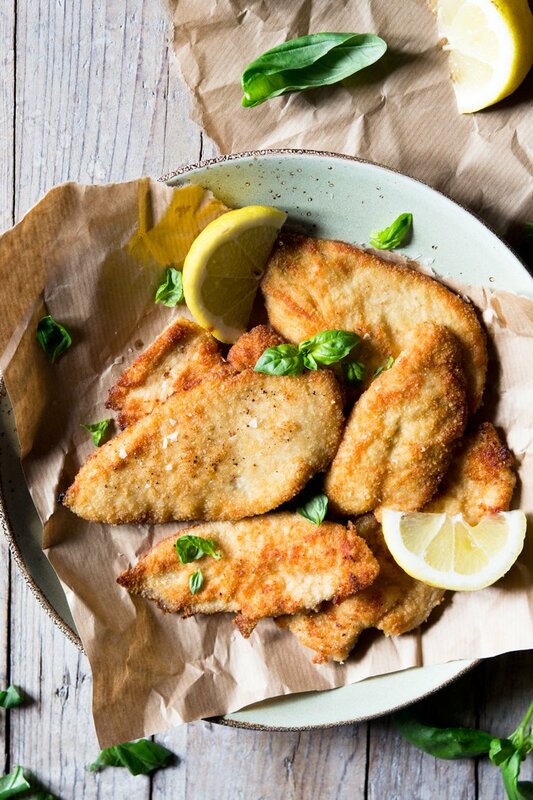 I always used to make my chicken cutlets with breadcrumbs, flour and egg but not anymore, oh no I’ve got a new method that’s not only better but easier and quicker too! 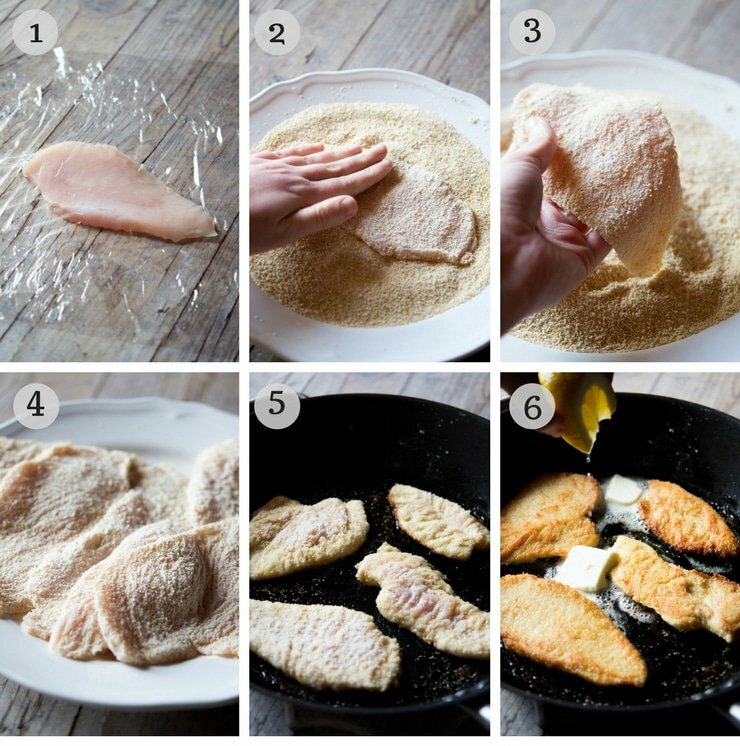 My boyfriend’s mum first told me about this way of breading chicken last summer after she tried it out a few times and let me tell you it’s so simple, you’ll wonder why you didn’t try it before. Whaaat, there’s no secret ingredient? No, there’s nothing fancy going on here, we’re just leaving out some ingredients we don’t need. So How Do The Breadcrumbs Stick To The Chicken? I asked this too when I first heard about it but they actually stick really well without any flour or egg. 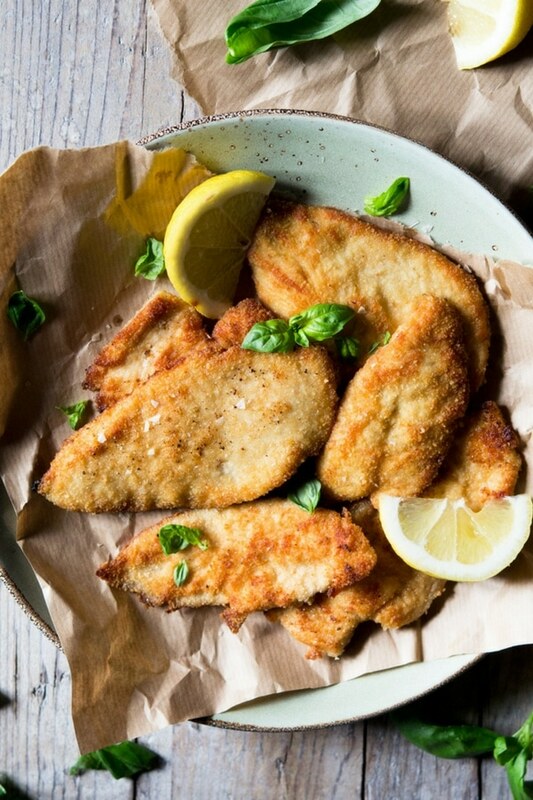 After you have bashed out your chicken to form thin cutlets simply press each side 2-3 times in the breadcrumbs until the cutlet is coated. It will be a much lighter coating than if you used flour and egg which results in a lovely crispy outside, juicy chicken inside and no floppy, soggy crumbs falling off either. First, you need to bash your chicken breasts out thin or buy pre-cut chicken cutlets from the supermarket for ease if they’re available. Add the breadcrumbs to a large plate and season with a good pinch of salt and pepper. Press each side of the chicken into the breadcrumbs firmly 2-3 times, repeat with all the cutlets. 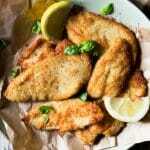 Heat a good glug of olive oil in a large frying pan and when hot add the chicken cutlets. Once crispy and golden on one side turn them over and squeeze over lemon juice then add a knob of butter. Continue to fry the cutlets until crispy and golden on both sides, remove and sit on kitchen paper or a draining rack for a couple seconds. Serve hot with salad or your favourite sides. Find some recommendations below. How easy is this recipe? I mean I’m totally converted to breading my chicken like this all the time. Who needs extra washing up anyway? I know I certainly don’t and I honestly love using this method. The chicken is lighter, crispier and just as delicious as ever! 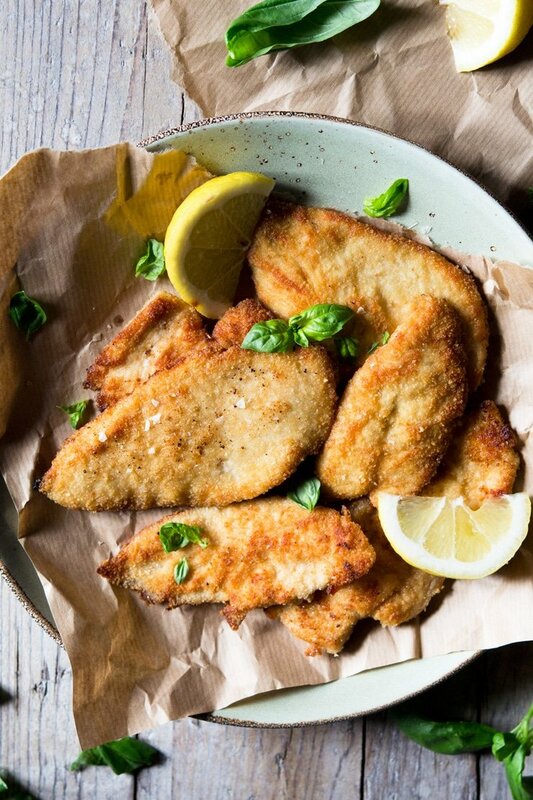 If you’ve tried these breaded chicken cutlets or any other recipe on the blog then don’t forget to rate the recipe and let me know how you got on in the comments below, I love hearing from you! You can also FOLLOW ME on FACEBOOK, TWITTER, INSTAGRAM and PINTEREST to see more delicious food and what I’m getting up to. Super quick breaded chicken cutlets fried in a lemon butter sauce. These crispy cutlets are made without any egg or flour making them so quick and easy to whip up. First, you need to bash your chicken breasts out thin or use pre-cut chicken cutlets from the supermarket for ease if they're available. Add the breadcrumbs to a large plate and season with a good pinch f salt and pepper. Press each side of the chicken into the breadcrumbs firmly 2-3 times, repeat with all the cutlets. 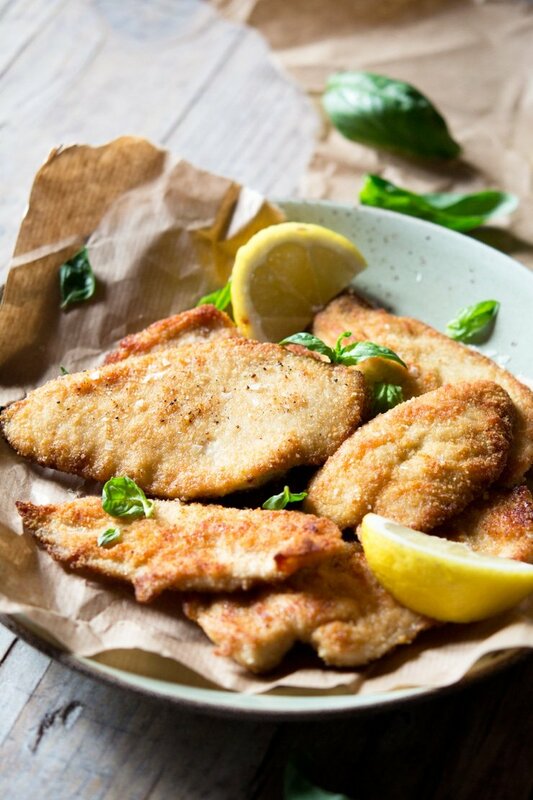 Continue to fry the cutlets until crispy and golden on both sides, remove and sit on kitchen paper or a draining rack for a couple seconds. Sprinkle with an extra pinch of salt. Serve hot with salad or your favourite sides. I just mixed the cheapest store-bought bread crumbs I could find with some generic chicken spices, put in the chicken breast (sliced thin) and pan-fried them in about three table spoons of olive oil. They were delicious! Thank you for the inspiration! Hi Denise, sounds so delicious, thank so much for stopping by! I’m lousy at frying. Can these be baked? Hi Barbara, yes, I haven’t baked them myself but I don’t see why it would work. I’d spray them with olive oil cooking spray or something similar if baking. Thank you! These look to die for! Love your simplified recipe and the photos are beautiful! These are a must-try, for sure. Thanks so much Sasha, so nice of you! This is such a genius idea! I love having crispy fried anything so getting rid of the unnecessary egg and flour is perfect! I love being able to leave out unnecessary ingredients and these sound amazing! Thanks – I can’t wait to try them b/c simple is always in style! Thanks so much Dina-Marie, I totally agree! This looks so easy and delicious .. being a mother of two boys who love chicken..I am always looking for some quick and fun Recipe ☝️ looks like I found one today! Excited to try it! Thanks Soniya, hope you enjoy! Oh my gosh we make chicken cutlets a lot but the extra dishes with extra steps is always a bother, so I really love that you’ve eliminated egg! And they look so fresh and crisp. I can’t wait to try this! Thank you Marlynn, hope you enjoy it! I love breaded chicken – such a comfort food my whole family loves! With the simple ingredients in this recipe, I’m sure it’s delicious. No egg needed. Total comfort food, thanks Erin! These look so good! I love that they don’t require an egg. It saves me time and the mess afterwards! Yes, who needs more dishes to wash?! Not me! I love a good old fashioned chicken cutlet. This is similar to how my mom made the but she dipped them in egg first. I like the idea of skipping the egg, since why waste an egg. They turned out golden and perfect! Thanks Vicky, this is definitely less messy!